Paraty, also called “Parati”, is often called the “jewel” of the Brazilian Atlantic Rainforest. Located in Rio de Janeiro State, between Rio de Janeiro and Sao Paulo, ”, Paraty received UNESCO World Heritage Site designation in 1966. Use Paraty Green Map before, during and after your visit to Paraty. Find the unique artists and historic pousdas well as the most authentic restaurants. Learn about the history and sustainable features of the local businesses. The culture of Paraty is diverse and based in traditions and festivals. 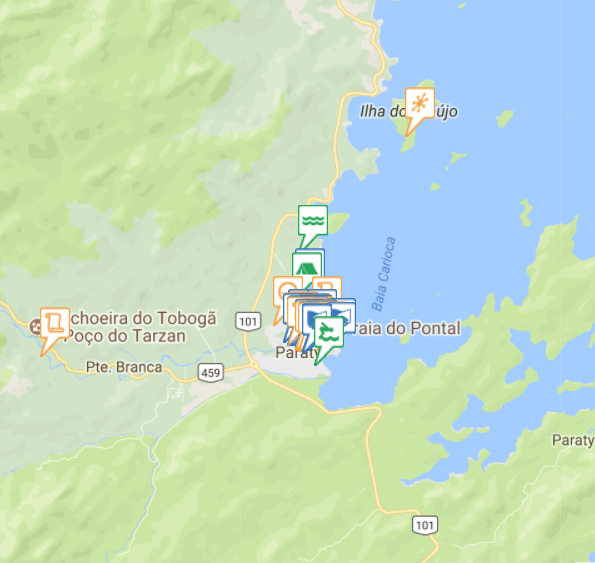 Paraty Green Map will make your trip to Paraty a memorable experience and you will know why that we call Paraty “the jewel of the Brazilian Atlantic Rainforest”.